Spinning Magic on Ohio Lakes Everywhere! Do you have a “go to” lure? That one you tie on because you KNOW you can catch fish on it? 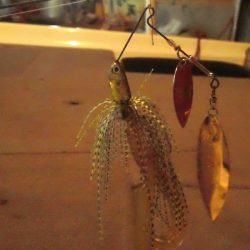 Every summer, I seem to find a “magic” lure – one that finds the fish no matter what. This year, it is one of my ‘ole favorites: a spinnerbait. Ohio spinnerbait fishing is a BLAST! I’ve always loved spinnerbait fishing for bass. Blades thumping and flashing, tail fluttering, it just lures fish right in. Boy, do they SLAM it, too! This year, Ohio waters haven’t disappointed. I have caught fish with THE SAME spinnerbait (albeit with many trailer changes) all summer long. Here’s a picture of it. It’s nothing fancy, or special. Just something pieced together with stuff I like the look and feel of. What makes it work so well? The red Sharpie painted blade? The sliced up twin tail trailer? The history I have in it catching fish? Maybe. I don’t know for sure, but feel free to copy and try. At Rocky Fork Lake, I was fishing logs & grass along the shoreline. At Seneca Lake, the target was along weed edges. 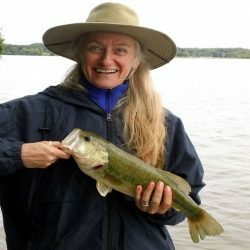 The bass were snapping along deeper shorelines at Pleasant Hill Lake and above deeper weeds in the last of the Portage Lakes, Long Lake. It’s been a LOT of fun so far! All I know is it’s made Ohio spinnerbait fishing a success story for me! I suspect confidence has a lot to do with it, too. I can control it well. It lands where I aim it. I can cast it into the wind relatively easy. It is easy to unhook the fish. It runs true at high speeds, can be fished through the weeds, and can be slow-rolled along the bottom. All these factors allow me to relax and focus on the water, the fish, and enjoying the day rather than the casting. I highly recommend tying on a lure you have caught fish with recently if you are having a slow day. There may be a little “magic” still left in it that turns your day around.